When the piste no. 2 – Silberschneid – is not yet open in autumn, this route is a perfect base for a fantastic ski mountaineering tour. 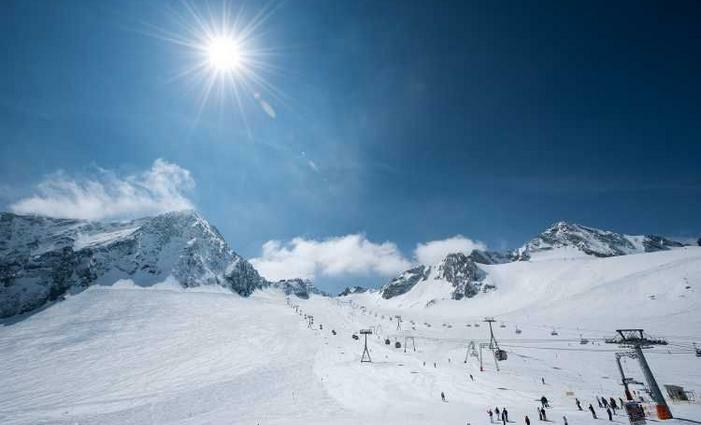 Take the new 3S Eisgratbahn or the Gamsgartebahn lift to the Stubai Glacier mid-station (2,300m). From there starts this ski mountaineering tour. Follow first the red piste. no. 2 – Silberschneid and continue then eastwards past the reservoir to get to the Gamsgarten (2,600m). From there you continue past the ice climbing tower and back to the Eisgrat mountain station (2,900m) along the winter hiking trail. Dear ski mountaineers on pistes! 1.) Respect warning notices and local regulations. 2.) If a piste or part of a piste is closed, you must not enter it. If piste grooming machines – in particular machines using cable winches are used – or if avalanches are detonated, life-threatening situations might occur. Pistes might be closed for the duration of the works for safety reasons. 3.) Ascend only at the edge of the piste and one after another in a row. 4.) Cross the piste only where it is easy to overlook and with long enough intervals. 5.) Ski on freshly groomed pistes only at the edge. Tracks, which freeze overnights, can have serious impact on the quality of the piste. 6.) Leave the piste by 4:30 p.m. or any other time specified by the lift company. 7.) Make yourself visible. Use a headlamp, reflective clothes etc. in darkness or bad visibility. 8.) If there are ascend routes especially for piste mountaineering tours, use only these. 9.) Do not bring dogs. 10.) Use designated parking spaces and pay possible parking fees.